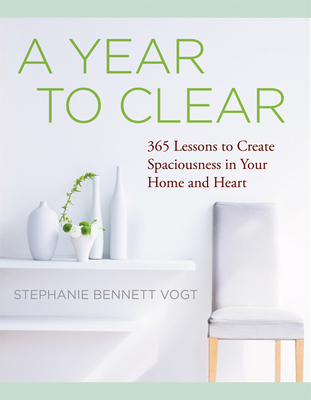 In A Year to Clear, leading space-clearing expert Stephanie Bennett Vogt takes you on a journey of self-discovery, letting go, and transformation. Each of the 365 lessons--organized into 52 weeklong themes--offers daily inspiration designed to release stress and stuff in ways that lighten, enlighten, and last. Stephanie's methods of gentle encouragement and humor will guide you to look at the items and clutter in your home not simply as a "mess" to be dealt with, but as an outward reflection of your inner presence. By using her clearing exercises to clean up on the outside and the inside, both your physical and emotional realms will return to a sparkling state of balance and serenity. Stephanie Bennett Vogt is a leading space clearing expert, international speaker, and the author of Your Spacious Self. She brings over 35 years of experience to SpaceClear, the teaching practice she founded in 1996 to help homes and their occupants come into balance. Stephanie teaches her inspirational clearing programs worldwide, including at Kripalu and the New England School of Feng Shui, and shares her unique perspectives on simplifying, personal reinvention, and letting go in the Huffington Post, DailyOM, and other venues. To learn more, visit www.spaceclear.com.